Michael Ballew grew up in the farm and cattle country of the vast plains in far North Texas. It's universally known that the magnificent sky and lonely emptiness of west and north Texas has spawned the prolific creativity of more than a few Texans... and so it's been for Ballew since the day he picked up his fathers old guitar at the age of ten, and instinctively started making music. It's an undeniable force that has taken him from those humble beginnings to spreading his own brand of Texas music to the far reaches of the world where faithful fans anticipate the humor and gritty frankness of his songs. Michael Ballew is what is known in the music business as a lifer, or if you prefer... a real trooper. He's strained for the high notes and poured his soul into guitar solos night after night in sweaty, smoky bars and basked in the spotlight on some of the most glamorous settings and prestigious stages in the world. 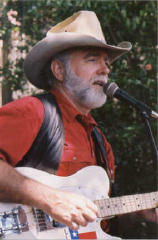 Now, after two albums, numerous singles, six CD's, two successful chart songs ("Your Daddy Don't Live In Heaven, He's In Houston", and "Pretending Fool") and having paid his dues in full, Michael Ballew has become what he always wanted to be... a fully seasoned writer/entertainer, finally getting the recognition and praise all artists crave from reviewers, DJ's and music lovers alike. When you hear his latest compilation CD "RODEO COOL", you'll also learn to appreciate the true and honest Texas content of this internationally successful recording artists music. "Michael and I have been pickin' buddies for a long time. His musicianship has always impressed me, and hearing him always takes me back to the good old days of Austin. Don't get me wrong; I like the new songs as much as the old ones, but see if you don't agree that this new album shows Michael at his Texas best. New or old, he's tearin' up the new millennium!" "The first time I met Michael Ballew was in 1978, or there abouts. He was playing in a bar in Austin, Texas called the Lock, Stock and Barrel. I had just moved back to Texas and I remember thinking to myself, man, if everybody down here sings like this, I'm in deep water. Luckily, nobody sang like Michael. You see, it is rare to find two things in this business, an original voice, or an original hand at writing songs. Michael has both of those rare traits. His songs express his love for our sweet mother Texas in a way only a bona fide, died-in-the-wool Texas boy could, and his voice is really like no other. I use to say, ?If Ballew drank a glass of water, by the time it hit his stomach, it would be strong, black coffee." Here's to you, Michael Ballew, and your special brand of music. I hope you live forever and I never die!" NEW SINGLE RELEASE IN EUROPE After two successful chart releases last year a new single "Damned Ol' Beer" will be released March, 2002 in Europe & Australia. This new song, a country western beer anthem, will bring in a new fan base for Ballew's steadily growing following. THREE European Tours in 2002 The"Damn Good Texas Band" and I are doing three European tours next year. One in the Spring (April 2-22, 2002) that will start in Denmark and head toward Norway & Sweden and two summer tours England & Spain in July for and France & Spain in August. Stay tuned for details. ***** 5-Star Review - COUNTRY MUSIC PLUS *****This is a super album. Great country sounds honed to perfection through years of toiling the barrooms and beer gardens of Texas. JULY 2002 Americana International Music Festival, UK Great news... Starting July 6, 2002 (& Michael's birthday) Michael and his "Damn Good Texas Band" will share the main stage at the Americana International Music Festival in England with Paul Overstreet and his "All American Band". The Americana Internat'l is one of the largest and most prestigious three day country music concerts in all of Europe. TOP OF THE WORLD - #1...Top of the Charts 4 Weeks in a RowMichael's second European single following the release of the title cut from the album "Rodeo Cool" joins the elite band of acts that have debuted at #1. The European Independent Airplay Chart reflects tracks proving to be the most popular as voted for by the most influential country DJs in Europe. American singer Michael Ballew's amazing ballad "Top Of The World" stayed in the #1 poll position (commencing October 14) for 4 weeks in a row and remained on the Top 40 Airplay chart for 14 weeks. AUGUST 2002 EQUIBLUES FESTIVAL & RODEO, FRANCE Michael Ballew and the Damn Good Texas Band, along with Rosie Flores, will be one of the headliners at the Equiblues Festival & Rodeo in France August 17th, 2002. Details to be announced. JULY 2002 COUNTRY MUSIC FESTIVAL, SPAIN Michael Ballew and the Damn Good Texas Band will be a headline act at the Country Music Festival (July 19-21, 2002) appearing on Saturday, July 20th in Terrassa, Barcelona, Spain. Ballew's Single Rises to #4Already building a name in the Europe marketplace through tour appearances, Michael broke over to radio audiences when the title track of his "Rodeo Cool" CD enjoyed a 13-week run in the EMS European Country Chart peaking at No. 4 during July, 2001. APRIL SCANDINAVIAN TOUR / WHAT A LINEUP When Ballew and the Damned Good Texas Band leave for Denmark and points north in April, the lineup will be: DODD MEREDITH, drums and vocals(Floyd Tillman, Hank Thompson, Roy Head Show Band, Johnny & Edgar Winter, Gene Watson, Darrell McCall and on and on); STEVE CARTER, bass and vocals (Stop the Truck, The Lotions); PRICE PORTER, steer guitar, harmonica & vocals; (Freddie Powers, Johnny Gimble); MICHAEL BALLEW, lead guitar & vocals. JULY EUROPEAN TOUR LINE-UP When we tour the UK and Spain in July the line-up will be: Dodd Meredith, drums and vocals (Floyd Tillman, Hank Thompson, Roy Head Show Band, Johnny & Edgar Winter, Gene Watson, Darrell McCall and on and on); Gene Kurtz, bass and vocals; Price Porter, steer guitar, harmonica & vocals; Don Raby, fiddle, mandolin and vocals (Hank Thompson, Chris Wall, Junior Brown, Don Walser, Jess Demain, Floyd Tillman & on and on); Michael Ballew, lead guitar & vocals. THANK YOU FOR #1I tip my hat in a warm salute to the DJ's that are playing my new single "Top Of The World" and helping to make it #1. Thank you. Tony & Yolanda Parera Visit Austin, TexasTony Parera and his wife Yolanda had lunch at Shoal Creek Saloon (one of my favorite places to eat catfish) last week. Tony, sure enjoyed the visit...hope to see you next year in Spain. Michael Travelling in Texas Michael reports "We're picking up Texas radio stations daily". My friend and drummer, Dodd Meredith is working the phones talking to dj's and I've been dropping in for on-air interviews. KVET (Austin) has been playing cuts most every morning (The Sam & Bob Show). They have the biggest listening audience of any radio shows in Texas. We still have alot of ground to cover (big state) but so far every station that has listened to Rodeo Cool starts playing it. Mostly "Damned Ol' Beer" and "Rodeo Cool". What encourages me the most is they are putting this cd in medium to heavy rotation. The Brownwood area and points north are pounding away. Real Cowboy country. Now the Ft. Worth area is starting to pick it up. Yeee Haaah!!! Special non-musical info for users & friends (18+).